Published 1/31/2011 . Last updated 1/12/2019 . Milky Way cupcakes are the first cupcakes that I have made which feature two layers of frosting. Like Milky Way bars , Milky Way cupcakes are topped with a layer of luscious, chewy caramel and a layer of creamy milk chocolate. Does double frosting equal double pleasure? You bet! The cake part of the Milky Way cupcakes is a chocolate malt cupcake with homemade chocolate malt nougat mixed into the batter. If you don’t have the time to make homemade chocolate malt nougat, you can leave it out and the Milky Way cupcakes will still be superstars (stars in the Milky Way galaxy, of course). I opted to make the Milky Way cupcakes as minis so that the cake to topping ratio would be closer to the nougat to topping ratio in an actual Milky Way bar. This worked really well, but if you prefer, you could certainly make them as full-sized cupcakes. Remember when we raised over $3000 for FilterPure? Wasn’t that awesome?! Well, as part of that fundraiser, I had said that anyone who donated over $200 would get a custom cupcake flavor designed especially for them. Jonathan (not my husband – another Jonathan) donated $200 and gave the custom cupcake as a birthday gift to his sister, Sarah. People with the name Jonathan are the best! Sarah said that she’d love a Milky Way cupcake. The only Milky Way cupcakes she’d ever seen just had crushed Milky Way bars on top of a basic cake – lame-o! I hope she enjoys these. Happy Birthday, Sarah! One last thing about Sarah: when I was emailing with her, I learned that she lives in London and is good friends with my cousin. Isn’t it such a crazy small world? Maybe she’ll bake these Milky Way cupcakes and share them with him and his family. I’ve never had a chance to bake him cupcakes so this would be a funny first way for him to try one of my creations. Sarah, if you do this, I must see a photo of the Milky Way cupcakes with my baby cousin Alice! For the chocolate malt cupcake, I used a modification of David Lebovitz’s devil’s food cake recipe. Here is the recipe with my modifications. Milky Way cupcakes feature two layers of frosting. Caramel and chocolate, just like the candy bar. 1/2 C cream soda If you do not have cream soda, you could use coffee or water. In a medium-sized bowl, mix cocoa powder, cake flour, salt, baking soda, and baking powder. In another medium-sized bowl, beat together the butter, sugar, and malt until smooth and creamy. Add the eggs to the wet mixture one at a time until fully incorporated. In a small bowl or liquid measuring cup, mix together the cream soda and milk. Stir half of the dry ingredients into the butter mixture, then add the soda and milk. Finally, stir in the other half of the dry ingredients. Divide batter evenly between 48 mini cupcake liners (you could also use 24 regular cupcake liners). Bake at 350 F for 15 minutes (it would be about 30 minutes for full-sized cupcakes). The cupcakes should bounce back when lightly touched. Update 7/18/11: Warning - While I loved these cupcakes, you'll see in the comments that many people have had trouble with the cupcakes sinking and just generally not coming out right. The recipe has worked for some people and I can't pinpoint the problem. Bake at your own risk. Not all caramel recipes are alike. 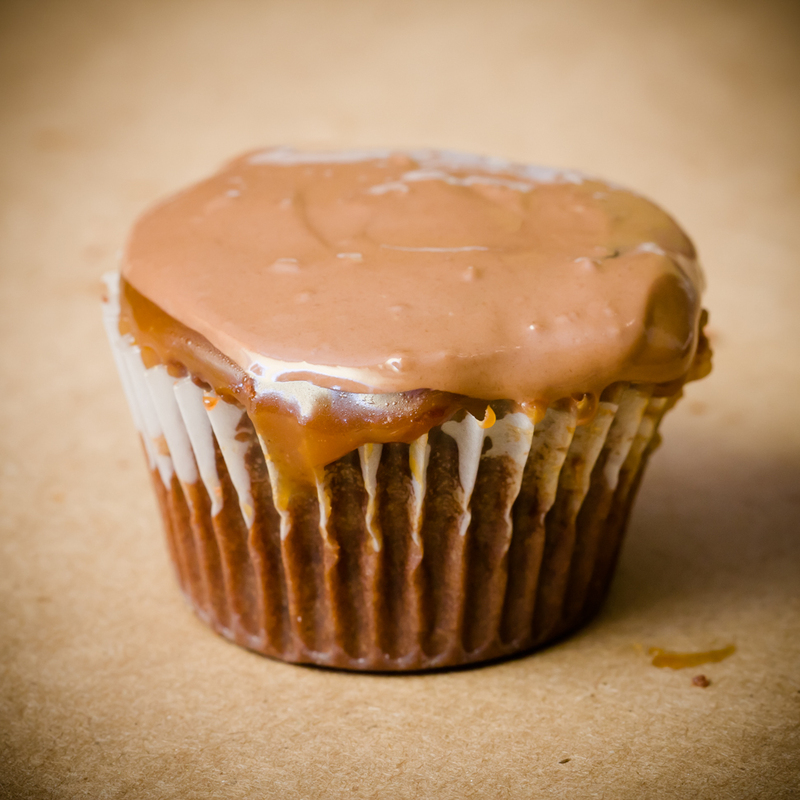 My favorite caramel recipe is the one that I used on my Southern caramel cupcakes. That one is harder (a little bit crunchy) than this one and has more of a pure sugar flavor. I also really enjoy my earthy, salty miso caramel. That caramel is on the other end of the moisture spectrum; not only does it not crunch, it drips (in a leaky faucet way, not an oozey, gooey way). The caramel recipe that I used for the Milky Way cupcakes is not my top caramel, but it is the one and only caramel to use for Milky Way cupcakes. It is just like the caramel in Milky Way bars. It’s the chewy kind of caramel that you see on every candy bar commercial – the kind that pulls like taffy if you break the bar in half. I found the recipe on Candy Bar Lab and only made one change to it, which I note below. This is the chewy kind of caramel that you see on every candy bar commercial - the kind that pulls like taffy if you break the bar in half. 1/2 tsp salt The original recipe called for 1/2 tbsp. I wasn't sure if this was a typo or if it was intended to be a really salty caramel. I only put in 1/2 tsp. 1/2 C corn syrup I use light corn syrup, which is not high fructose corn syrup. In a small bowl, mix the heavy cream and salt. In a small heavy-bottomed sauce pan on low heat, mix the sugar, corn syrup, and water with a whisk until the sugar is completely dissolved. Raise heat to high and boil mixture up to 315 F on a candy thermometer. Do not stir during this time. But do watch your pot VERY closely. I burnt my first batch by not paying attention. This prompted me to get a Maverick candy thermometer that beeps when the correct temperature is met. I haven't tried it yet, but it sounds like the best thing ever! Remove from heat and swirl the pot gently. You’ll notice the mixture start to darken a bit. The residual heat will bump the temperature to 320 F, the point of caramelization for sucrose. Drop the butter pieces into the pot and whisk vigorously until the butter is incorporated. Wear an oven mitt to protect your hands and forearms during this and the next step because the butter and cream both have water so they will cause the caramel to bubble up and release very hot steam. Pour in the salted cream and again whisk until blended. The caramel will thicken as it cools, but it should remain soft and gooey at room temperature. Spread onto room temperature cupcakes. 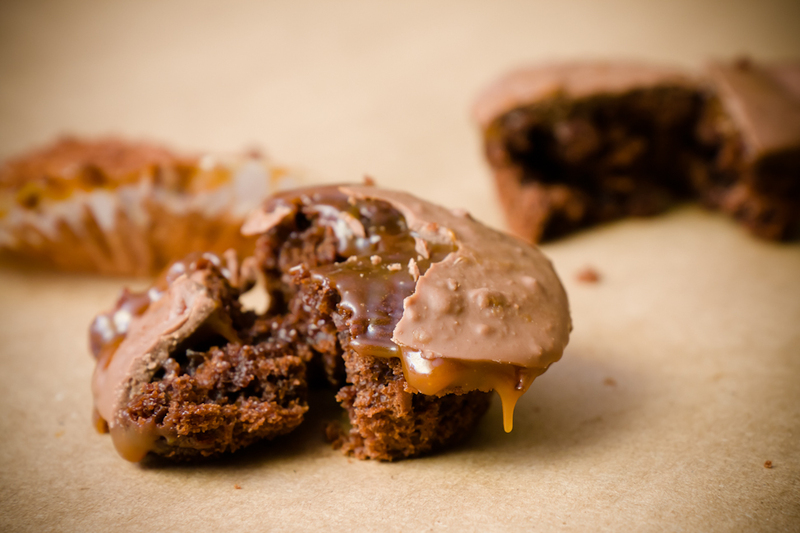 The milk chocolate on top of the caramel needs no recipe. It's not a ganache or any kind of fancy chocolate frosting. It's milk chocolate that is melted (I melt mine in the microwave) and then spread on top of the caramel. Easy peasy! Start by melting about 6 oz of milk chocolate and melt more only if you need it. omg … these cupcakes sound amazing! All my favorite flavors in one cupcake? Yes, please! mmm…these sound fabulous even though I’m not a nougat fan either. Thanks, Stef (and Jonathan)! What an awesome birthday gift. I will make them as soon as I find the time (which could take a while with 2 kids 3 and under at home), and will be sure to share them with Alice’s Mommy and Daddy! My favourite this year, Stef. It’s only January too. You had me at double frosting. ;) These look delicious. Hi! I’m Bakerina the Baking Ballerina! Please follow my blog to read about my latest baking projects! Let me know what you think of my cupcakes! THANK YOU! Holy geez. These look incredible. I think I just got a sugar rush from these pics. Must. Try. ASAP. So it turns out the hardest part will be getting some very American ingredients here in London (malt powder, unsweetened chocolate, corn syrup), but I’m sure I can find them online. A question about the malt in the cupcakes. Is it the same malted milk powder as in the nougat? And is it “original” flavor, not chocolate? Sarah – Yes, it’s original malted milk powder (not chocolate). I’m going to update the post in case anyone else is confused. My kids will love this. That is one thing that I am sure of! I am going to try this one. Sarah, Corn Syrup is golden syrup, Malted powder is Ovaltine or Horlicks and unsweetened chocolate is plain chocolate! TheFosterFamily – I don’t know anywhere that you can buy it, Sorry. I made this batter twice and it didn’t come out either time. Both times, the cupcakes overflowed and sunk in the middle. (They still tasted awesome!) Any idea what I did? I do bake quite often and never had this problem before. I would love to make these for a wedding. takeeleh – Wish I could tell you what happened. But, I can’t say. Maybe you overfilled them (if they overflowed). You could always just pile on more caramel and ganache to fill the divot, if you are happy with the taste. I’m having the same problem with the cupcakes falling in the middle. I had a really hard time with this recipe when it came to baking. The tops end up being super crusty, and the papers are near impossible to get off. Anon – Sorry that you had problems with it. :( Do you take the cupcakes out of the tins when they are still hot? I find that that helps the wrappers stick less. I have never make Milk Way Cupcakes because the making of this flavor is really very tough,but one day i will definitely make this its challenge for me. Thank you for sharing this recipe! I made these yesterday for a friend’s birthday and they were, as she kept saying (we’d had a few mojitos – now there’s a cupcake recipe to tackle if you haven’t already!) “these are stellar. No really, they are out of this world..” tipsy giggling ensues… I did make an actual super-chocolate buttercream icing instead of the melted milk chocolate. Thanks again! I’m a newcomer to your sight and really enjoying reading it! I too had the same problem, they overflowed, sank almost to the bottom of the cup and the paper’s are impossible to get off. I am going to attempt it again and see if I can figure this out. As a side note, I made the homemade nougat for these, OMG!! It is totally amazing! Sticky, and messy to make but totally worth it!!! I too had a problem with this batter. It completely sank in the middle and it was hard and crusty around the edges. This looked so good and I was so excited to make them! I am super disappointed… it was a great idea though! The homemade nougat was incredible!!!! Wish I’d read the comments before I made these .. 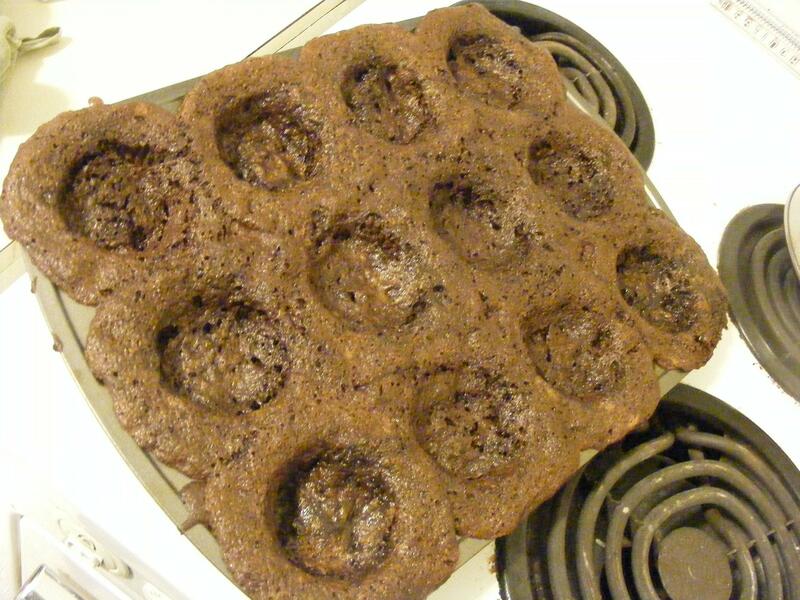 Mine looked just like Lizzie’s~ the same problem that everyone else had and it left me with a mess in my oven. This recipe should be taken off of your website.. Takes hours and is a disaster! I believe it may depend on the malted milk powder you use. Diastatic malted milk powder is used by bakers to give bread a nice crust, but it shouldn’t be used in supcakes because the tops will crust over very quickly and collapse into the still-liquid batter underneath. Non-diastatic is used for the malted flavor, and would make much more sense in this recipe. *gasp* Redditors DO go to other websites! Your Milky Bars don’t appear to be the ones we have in the UK. Ours have a fluffy white nougat filling and no caramel. This looks more like a Mars Bar. How strange that a chocolate with the same name is different across the pond! Your cupcakes look delicious regardless. I’ve determined that the overflowing problem lies in the addition to the nougat to the batter. I tried a different chocolate malt cake recipe and added nougat to it with similar results to Lizzy’s picture. Subtracting the nougat yielded a perfect cake. I’m thinking the nougat expands under heat similar to the effect of marshmallows in a microwave. it has an irregular shape or so how will i know? im barely in 5th grade. Our nougat didn’t set properly. We are in Texas however, and we had 80% humidity today. Makes perfect sense. The cupcakes without the nougat cooked beautifully. We will never buy a devil’s food mix again. Suggestions on how to get the nougat into the batter since I can’t crumble it? My 9-year old daughter really wanted to make these despite the warnings … But we should’ve listened! Awful mess, and one upset little girl. Hey I know the problem that people are having with this recipe. Cup measurements measure volume, not weight. Weight is more accurate because the vplume can change. It it mostly the flour that causes the problems. Many people just dip ther cup into the flour whereas others will spoon in the flour (this is closer to the weight amount). But that can general problem with cup measurements. I again apologize for the problems people are having. I did add the warning to the recipe. I’ve added this to my short list of recipes to re-do and try to fix. Gave these a go, the batter was a normal cake batter consistency to begin with. However, after about 15-20 mins in the oven the batter began to overflow quite badly. Then the center collapsed. Some edible stuff left in the middle, tastes good, but a terrible mess overall. * the nougat we made hadn’t set properly, so it may have changed the batter behavior quite a bit. I love cake :) Thanks for your recipe. i’ll try to make for my girl friend. can you explaine more detail? There’s always something interesting here to make the kitchen home a mess again:) Unlimited cookery. I like cake, Thanks for the recipe. I will try to make with my wife.